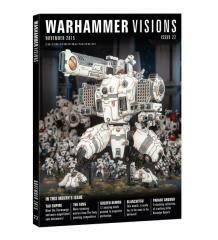 #22 "Tau Empire, Golden Demon Awards, Blanchitsu"
Warhammer Visions 22 arrives like an alien transmission from the edge of the galaxy – that’s right, the Tau are back, surging across the Damocles Gulf once more for the latest stage of their Third Sphere Expansion. The issue has got sumptuous photographic treatment of all the new kits – the mighty Stormsurge ballistic suit, the Ghostkeel Battlesuit, XV8 Crisis Teams and more! Elsewhere, it brings you some of the Imperium’s most dogged defenders in Army of the Month, and the second part of the series presenting the best entries from the Fang painting competition, a beautiful Dark Elf army in the Lords of Despair, Orc master-painter Graham Shirley steps into the spotlight plus there’s Armies on Parade, Parade Ground, ’Eavy Metal, Blanchitsu, a look at some of the finest Golden Demon duels down the years, and still yet more. Get it now!